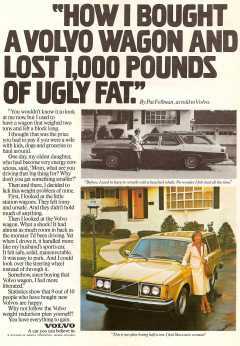 "HOW I BOUGHT A VOLVO WAGON AND LOST 1,000 POUNDS OF UGLY FAT." By Pat Fellman, as told to Volvo. You wouldn't know it to look at me now, but I used to have a wagon that weighed two tons and felt a block long. I thought that was the price you had to pay if you were a wife with kids, dogs and groceries to haul around. Then and there, I decided to lick this weight problem of mine. First, I looked at the little station wagons. They felt tinny and unsafe. And they didn't hold much of anything. look over the steering wheel instead of through it. Somehow, since buying that Volvo wagon, I feel more liberated." Statistics show that 9 out of 10 people who have bought new Volvos are happy. Why not follow the Volvo weight reduction plan yourself? ©1979 Volvo of America Corporation. Leasing Available. 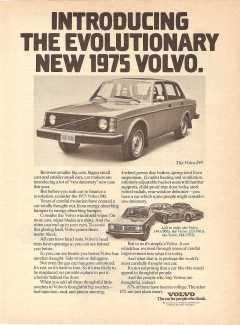 INTRODUCING THE EVOLUTIONARY NEW 1975 VOLVO. Between smaller big cars, bigger small cars and smaller small cars, car makers are introducing a lot of "revolutionary" new cars this year. But before you rush out to finance a revolution, consider the 1975 Volvo 240. Years of careful evolution have created a car totally thought-out, from energy-absorbing bumper to energy-absorbing bumper. So you can see beside you better, Volvo has another thought. Side window defoggers. Not even the gas cap has gone unnoticed. It's red, so it's hard to lose. So it's less likely to be misplaced, we provide a place to put it: a holder behind the door. fuel injection, rack and pinion steering, 4-wheel power disc brakes, spring-strut front suspension, 12 outlet heating and ventilation, infinitely adjustable bucket seats with lumbar supports, child-proof rear door locks, steel belted radials, rear window defroster—you have a car which some people might consider revolutionary. improvement into what it is today. And what that is, is perhaps the world's most carefully thought-out car. It's not surprising that a car like this would appeal to thoughtful people. And the people who buy Volvos are thoughtful, indeed. 87% of them have been to college.The other 13% are just plain smart. The car for people who think. ©1974 Volvo of America Corporation. Overseas Delivery Available. THIS WAGON CHALLENGES EVERY REASON FOR NOT OWNING A WAGON. Every year, the Sports Car Club of America holds a series of races with a class dedicated to sedans. But in '86, Volvo gave the race a larger dimension: the 740 Turbo Wagon. The first wagon to ever compete in this SCCA series. The results? In the first five races, the 740 recorded the fastest qualifying times twice. And led one endurance race for five out of six hours. More important, though, is that the 740 finished every race it started. A statement some of the performance sedans can't lay claim to. And one that may make the 740 Turbo Wagon something unique among performance cars. The get-up-and-go that gets you where you're going. 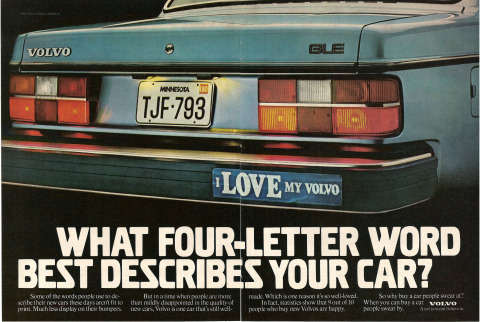 1979 Volvo 240 Ad: What Four-Letter Word Best Describes Your Car? This is one of the few two-page Volvo 240 ads that I have seen. WHAT FOUR-LETTER WORD BEST DESCRIBES YOUR CAR? Some of the words people use to describe their new cars these days aren't fit to print. Much less display on their bumpers. But in a time when people are more than midly disappointed in the quality of new cars, Volvo is one car that's still well-made. Which is one reason it's so well-loved. In fact, statistics show that 9 out of 10 people who buy new Volvos are happy. So why buy a car people swear at? When you can buy a car people swear by. The front cover of this 1980 brochure features a Carlsbad Yellow 240 DL Sedan, a Kingsmere Green 240 GLE Wagon and a Scotia Blue 240 DL Sedan. 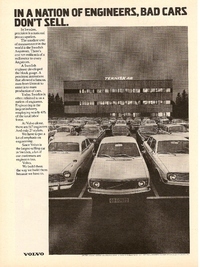 1979 Volvo 240 Ad: Love Letters to a Car Company? This 1980 ad features a beautiful photo of a Carlsbad yellow 240 sedan with quad-round headlights. 1986 Volvo 760 GLE Ad: A Good Driver is a Product of His Environment. A GOOD DRIVER IS A PRODUCT OF HIS ENVIRONMENT. Say all you want about traffic laws, speed limits and automotive safety features, when you slide behind the wheel of a car you're responsible for your own destiny. The interior of this Volvo 760 GLE is designed with that responsibility in mind. Every aspect of the car's interior - from the shape of the knobs and placement of the controls to the adjustable lumbar support in the orthopedically-contoured bucket seats - is designed to make the driver and the machine one. Something that's apparent when you test drive a 700 Series Volvo. And discover how much performance a car can get out of you. THE 700 SERIES BY VOLVO. ©1986 Volvo North American Corporation. If you don't believe it, strap yourself into the cockpit of a Volvo 740 Turbo and take off. This flying machine will rocket you from a standing start to legal speed in 6.7 seconds. * Faster than a BMW 325e. Faster than an Audi 5000S Turbo. Faster, even, than the much-touted Saab 16-valve Turbo. "Enough juice to kick you squarely in the seat of the pants." exclaims Autoweek. "...A brisk rush of surprise and pleasure....Exemplary performance and handling," say's Road & Track. So check into your Volvo dealears and log some time in the intercooled 740 Turbo. *Based on tests conducted by Car and Driver. THE BASIC IDEA BEHIND THE VOLVO TURBO WAGON. Basically, the rig pictured above can do anything a Volvo 740 Turbo Wagon can do. It will hold loads of cargo. Out-accelerate many performance cars. And reach top speeds of over 100 MPH. It will also pull about 150 G's. 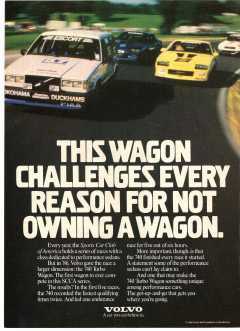 Which is why it pays to consider a Volvo 740 Turbo Wagon instead. Its 74 cubic feet of cargo space is greater than most wagons in its class. While its performance rivals that of some of the world's top sports cars. You see, unlike other wagons, both ends of the Volvo 740 Turbo Wagon were built for hauling. This is the 1983 Volvo 240 Accessories Catalog. The shows a 1983 Volvo 240 Turbo with a great looking Virgo 5-spoke rim. View the whole 1983 Volvo Accessories Catalog. 1995 Volvo 850 Ad: What on earth did they put in the Herring over there? What on earth did they put in the HERRING over there? It says "Volvo" on it. There, all resemblance ends between Volvo as you know it and the limited edition, 240-horsepower, sport suspensioned, turbocharged performance machine you see pictured here. It's called the Volvo T-5R. It also comes in black. ©1995 Volvo Corporation of North America, Inc. A total of 1,000 T-5R limited edition cars produced. Always remember to wear your seat belt. 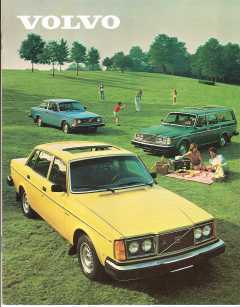 My family had the 1976 Volvo 245 wagon featured on page 5 of this brochure. Our 245 wagon was the same green as the 265 wagon fatured on page 4. View the entire 1976 Volvo 240 and 260 Brochure. 1980 Volvo 240 Ad: Old Volvos Never Die. They Pass On. This ad features the last year of the old style quad round headlights. It also includes a photo caption that says, "Bill Mozer with his new Volvo. And his family with his old ones." Witness the case of William Mozer a broadcast engineer. Over the years he's bought five Volvos and they're all still in the family. You see, instead of trading in his old Volvo every time he wants a new one, he passes it on to a member of his family. Because he believes his family is better off in a used Volvo than in any new car. So if you're tired of buying cars you run into the ground in no time, do as Mr. Mozer did. Buy a car that could run in the family for years. Volvo is a vehicle designed for investors interested in good performance over the long term. Its not uncommon to see Volvos driving around with hundreds of thousands of miles on them. There's at least one Volvo, still in good health, with close to one million miles on it. You can't ask for a better record of performance than that. Your Volvo dealer has a blue chip selection of Volvo 240 sedans and wagons to choose from. Execute your buy order today. Roofrack optional. ©1986 Volvo North American Corporation. VOLVO A car you can believe in. 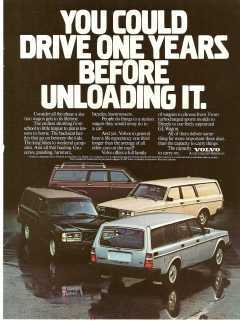 1984 Volvo 760 GLE Ad: One of the world's greats cars. Personally, I was never much of a fan of the Volvo 700 series. I always thought that these cars looked a little too much like everything else on the road at the time They lacked the distinct styling of the Volvo 200 series. Upon reflection it occurs to me that this may have been the point of the 700 series. One of the world's greats cars. There are certainly luxury sedans you could pay a lot more for than the Volvo 760 GLE. But very few of them would give you so much in return. The performance is startling. More than one test driver has been pinned back in his orthopedically designed driver's seat. Road and Track has called the turbo diesel "the fastest diesel we've ever tested." Rather impressive when you consider it's our gas engines that are built for speed. A revolutionary suspension system not only smooths the road, it calms the driver. As another reviewer put it: "Feeling comfortable and relaxed behind the wheel at 100 m.p.h. was truly an uncommon experience*...this is a first class performance machine." Even standing still, the 760 GLE will move you. It offers a host of amenities ranging from a stereo system so sophisticated it comes with its own graphic equalizer, to a climate control system that can change the interior air four times a minute. So take a look at the new 760 GLE from Volvo. And discover one of the great investment vehicles of all time. The 760 GLE by Volvo. *Though the 760 GLE is capable of this, it should never be attempted by anyone other than a professional driver under controlled test track conditions. Should I ever be lucky enough to own another 240, I would like it to be this model. The text of this ad states. 100 TO 0 in 3.2 seconds. One of the few things more impressive than how fast the Volvo GLT can take you from 0 to 100 km/h is how fast, and safely, it can bring you back again. The Volvo GLT has power-assisted disc brakes on all four wheels to help you stop straight and true. The GLT's other handling features are equally impressive: rack-and-pinion steering, Macpherson struts, gas-filled shocks, heavy-duty sway bars front and rear, high-performance Pirelli P6 radials. All of which would be totally unnecessary on an ordinary car. But as a short test drive will prove, the Volvo GLT is anything but. This ad shows a 1980 Volvo 240 GLT, with the gorgeous 5-spoke Virgo rims, cruising up a mountain road. Over the years, Volvo has come to be known as one of the most sensible cars you can own. So, sadly, people who pick their cars for more emotional reasons may have denied themselves the satisfaction of driving one. But now there's a Volvo even for those to whom practicality takes second place. Its striking appear-ance is the first hint that the GLT is quite unlike its predecessors. But the proof's behind the small-diameter GT wheel. A new four cylinder, fuel-injected overhead cam engine is standard equipment in our GLT, providing a level of acceleration and quick¬ness that many six cylinder engines have trouble matching. And its handling offers a feature even harder to find: predict-ability. The GLT is designed to react the same in panic situations as it does in normal driving. So it not only presents the driver with no surprises, it can actually improve his performance. Every GLT also comes fully-equipped with Volvo's more traditional virtues. Like an interior capable of comfortably accom-modating five full-size adults. Orthopedically contoured seats. And the superb engineering that's responsible for Volvo's famed life-expectancy: In Sweden, by latest count, an average 18.7 years. Before you purchase a performance car, test-drive the new Volvo GLT. The pure exhilara-tion you'll feel may have little to do with logic. But if your heart insists on a GLT, relax. Your mind will be getting a Volvo. 1972 Volvo 140 Ad: In a Nation of Engineers, Bad Cars Don't Sell. In a Nation of Engineers, Bad Cars Don't Sell. In Sweden, precision is a national preoccupation. The smallest unit of measurement in the world is the Swedish Angstrom. There's one ten-millionth of a millimeter to every Angstrom. A Swedish engineer developed the block gauge. A precision instrument that allowed a famous man from Detroit to enter into mass production of cars. Today, Sweden is often referred to as a nation of engineers. Engineering is the largest industry, employing nearly 40% of the total labor force. At Volvo alone, there are 517 engineers And only 27 stylists. We have to put a lot of emphasis on engineering. Since Volvo is the largest-selling car in Sweden, a lot of our customers are engineers too. We build them the way we build them because we have to. See the Dealer Nearest You and Test Drive a Volvo with Electronic Fuel Injection. Overseas Delivery Available. 1972 Volvo, Inc.